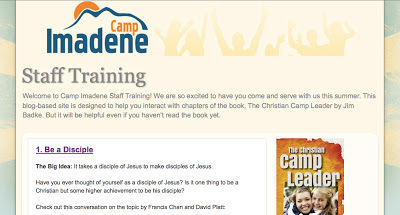 I recently updated a web project for Camp Imadene, a simple blog-based site that is designed to help their weekly volunteer staff interact with The Christian Camp Leader as they read it before the summer. They kindly allowed me to post the site here as an example of what your camp could do along the same lines. Click here to see it.